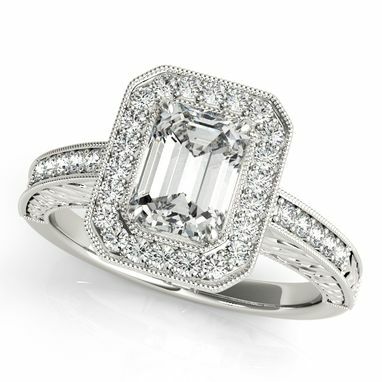 Propose with this vintage inspired emerald cut engagement ring. It's a truly stunning piece of jewelry that she will love to wear on her finger. 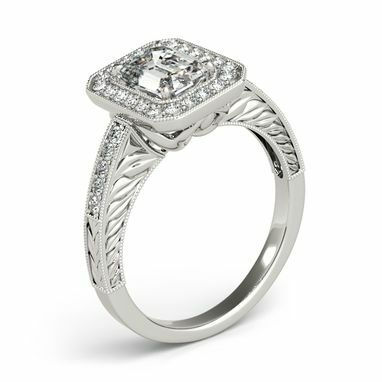 This emerald cut diamond center stone is prong cut and is approximately 1.50 in carat weight. An additional 28 prong cut diamonds surround the center stone as well as the band for added brilliance. Filigree scroll work and milgrain edges are the antique touch to this engagement ring that is crafted in 14k White Gold.